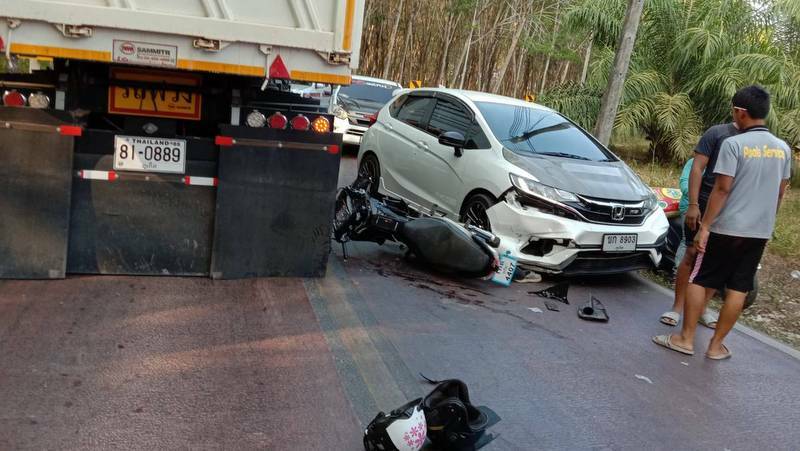 PHUKET: Two motorbikes were struck by trucks with trailers on Sunday (Mar 17) in two separate incidents on a road where trucks with trailers are prohibited. Both accidents occurred on Rural Rd 4015 in Bangjo, Thalang (see map below). 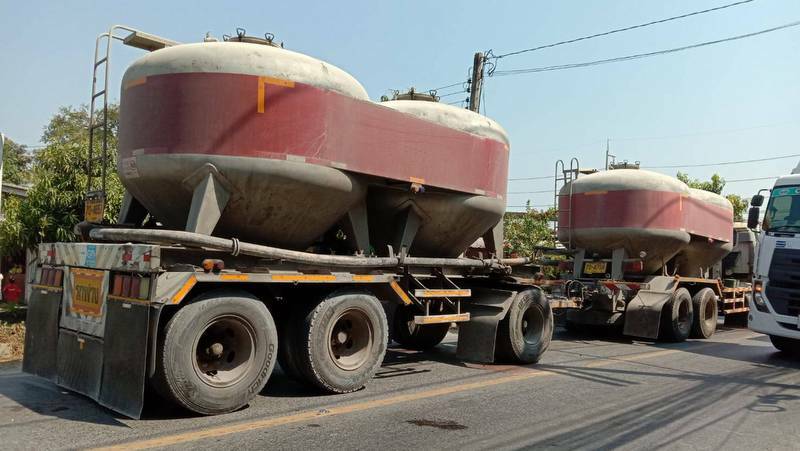 The first accident took place at about 10:28am at which time Thalang Police were notified of a 22-wheel truck, including a trailer, hitting a motorbike. 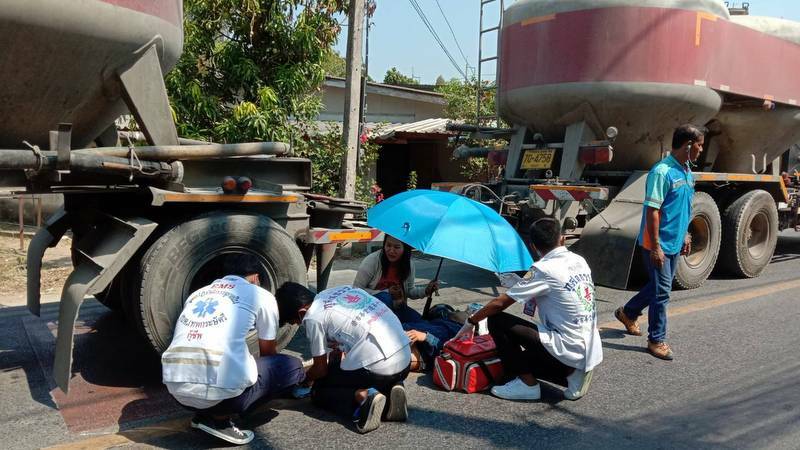 Capt Kraisorn Boonprasop of Thalang Police coordinated with Kusoldharm Foundation and OrBorTor Thepkrasattri rescue workers to find the motorbike driver injured at the scene. Rescue workers took him to nearby Thalang hospital where he was treated for a broken leg. The second accident occurred later the same day at about 5pm. The accident happened on the same road involving another 22-wheel truck, a motorbike and a car. 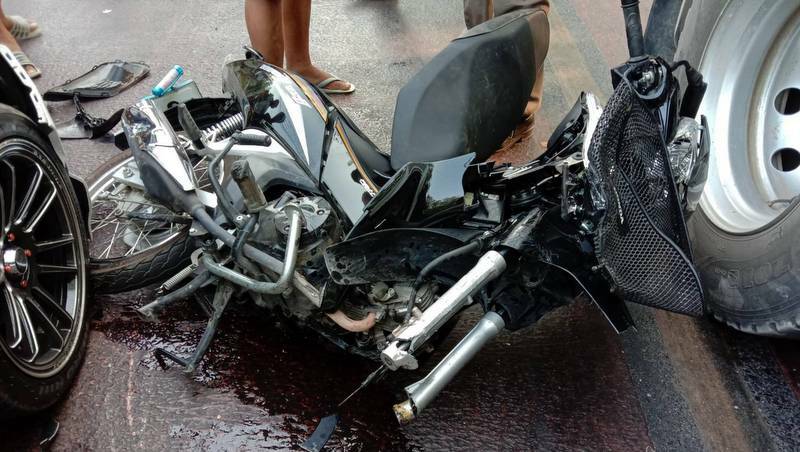 Capt Kraisorn reported that there were three Myanmar nationals on the motorbike. 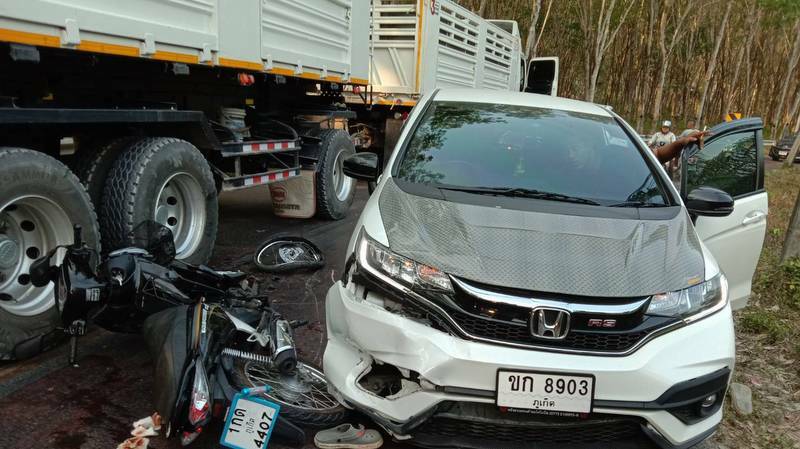 All three were injured and taken to Thalang Hospital. 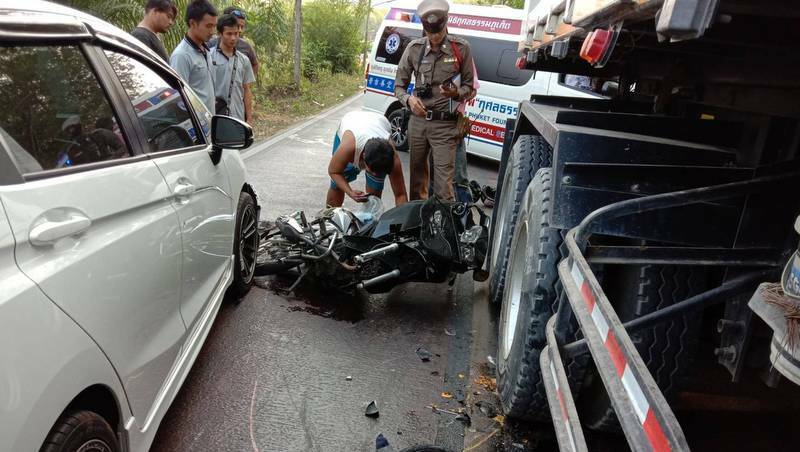 The driver of the motorbike was seriously injured. 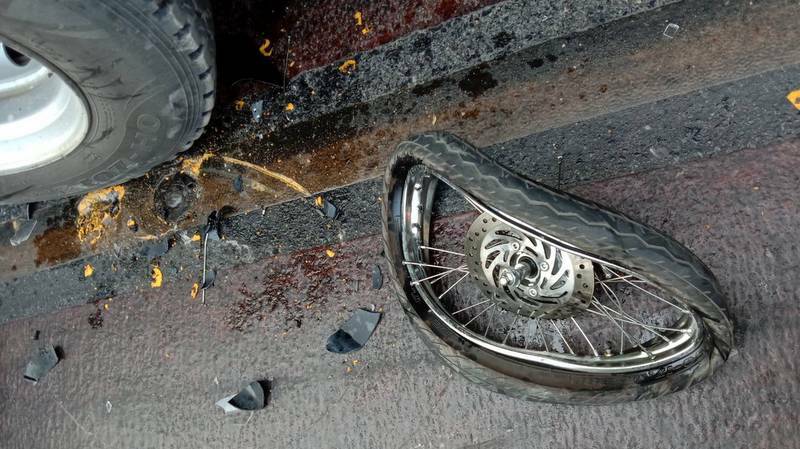 The latest accident on that particular section of the road highlights previous complaints from locals that large vehicles should not be allowed to use the road due to the dangers they pose on such a narrow, busy road. 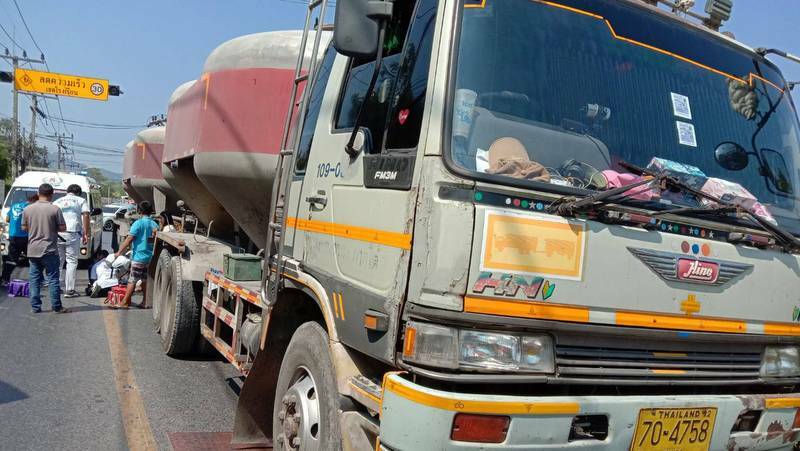 Following Sunday’s accidents, locals again raised concerns about how large trucks with trailers were still using the road despite the existence of road signs and numerous casualties involving such vehicles. 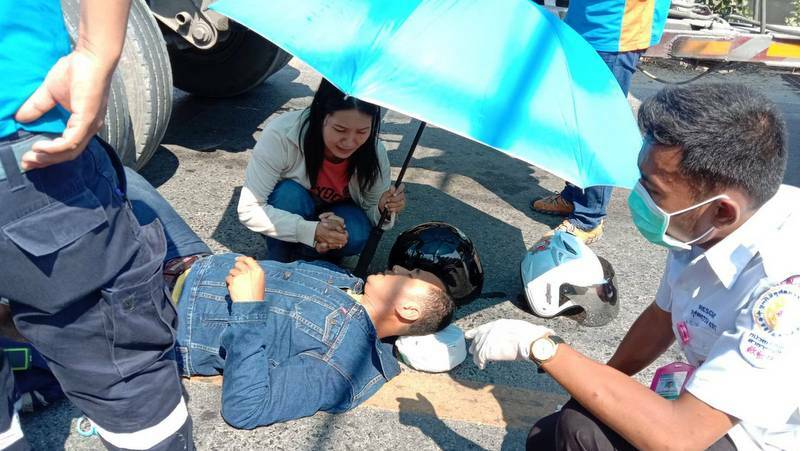 Locals complained that police were not doing enough to ensure the safety of road users there, despite the fact that one of the victims was the wife of a local police officer. They asked police and Srisoonthorn Municipality officers to address the issue to prevent similar accidents in future. 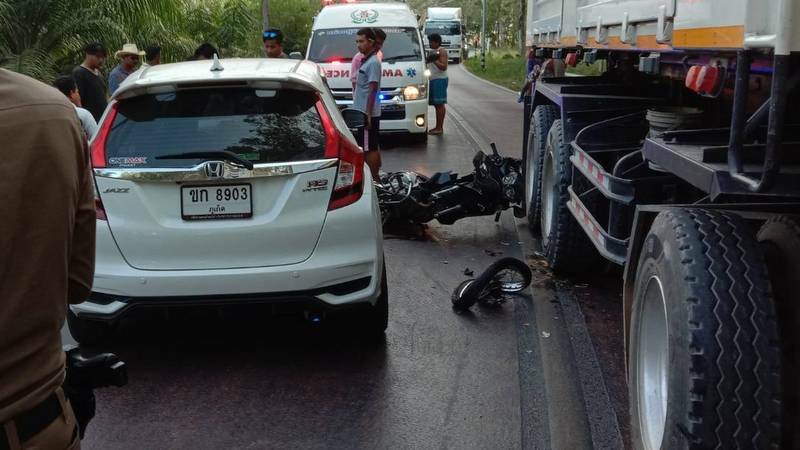 Constantly making stupid comments that defend unsafe driving behaviors, pretty much every backward, corrupt, dangerous aspect of life in Phuket. Now that is a Troll. I can only imagine that you are profiting from the current system and don't want change. By the way, I saw another concrete truck flip on that road just last week. no injuries luckily. Why is the truck on the wrong side of the road, and what part of the accident involved the pickup? "Where has the reader been the last decades" and what country is suspending a license for 10 years for driving on the wrong road,even when involved in an accident.Please educate me on that. And i totally agree about the egg. One wonders who the real troll is... . I use the road on a regular basis and it IS dangerous if one is not aware of how others drive on it. It was a handy link road until the big trucks stated using it. Sit back and enjoy your ... and BITTER lemon. 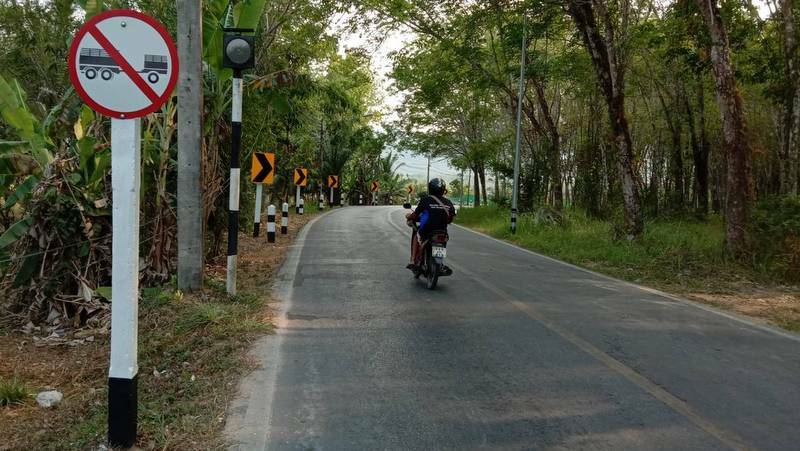 Oh, and tourists do still come here and drive that road, reading the road signs and expect people, including the thai,  to obey them. Not expecting unlawful happenings as reported in this article. That is not difficult to understand. Does it? Even locals are baffled. Where has the reader been the last decades, saying ' that is new to me', not knowing that in 4.0 countries is effective traffic law enforcement? And there is not a mentality:" The law is not for me, I do what I want on the road or with my speed boat", causing destruction, disasters, and personal harm. Lost lives, life time being disable? Wake up. 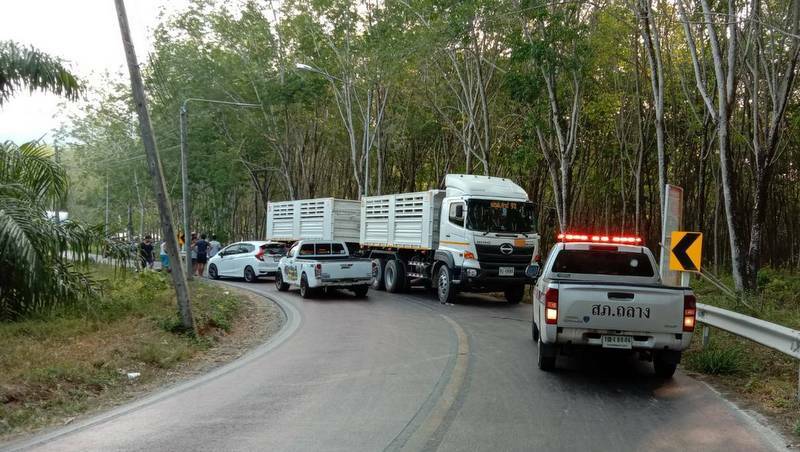 You don't need to live here or be that intelligent to see Thailand for what it is, this road is not made for large vehicles as the signs say, add to that the sheer stupidity of the drivers it's only a matter of time, stick to the topic apologist!
" Clearly Thai's do not follow any rules..." More generalizing racist rant from the same person again and again. He deserves an "Fraser Anning" egg too. ""I drive this road often enough"" so, what is your "constructive" thoughts on solving this problem... instead of you usual criticizing, or are there simply no thoughts at all, you constant dribble complaining about others does not help and we wonder why, surely you can give some thought to overcoming some of the islands problems, that even the Thais acknowledge. "Ban the drivers license for 10 years"Oooh,that's what they do in Singapore or other 4.0 countries ? That's news. "I drive this road often enough" Funny that someone who doesn't live here and doesn't understand why tourists still come here still drives on that road. What a load of BS from the troll. This road has become a very dangerous rat run for vehicles accessing Thepkassatri Road over the past 12-18 months. Clearly Thai's do not follow any rules unless they are made to financially, the result is ongoing carnage, I drive this road often enough, these trucks are far too big for it, drivers an absolute menace on such a small road they come barreling along in such a reckless manner, but alas do not rely on the BIB to do anything except the usual rhetorical lip service, same same just different day. Maybe some sort of "Traffic Enforcement" police could be hired to patrol the roadways and enforce traffic laws. Pull over such illegal vehicles as these trucks. Enforce speeding, helmet, and safe driving laws. Doesn't seem like it would be very difficult to make the roads safer.